Precious Kara Tippetts, wife of Jason, mother of four, and author of The Hardest Peace, made it home yesterday. She got her “well done, good and faithful servant.” She got her crown of life. Kara fought the good fight. Her battle is over. She scaled the mountain of The Hardest Peace .. and now she knows eternal peace. There is no more hard for her. She didn’t cower away and crouch down to shield herself from the ugly pain of suffering. She held her candle high, standing firm on the sturdy hill of sufficient grace, and she let it shine. For Him. Though outwardly she wasted away, inwardly she was renewed day by day (2 Cor. 4:16). She did not lose hope. She suffered. And she died with dignity. Much like the One she worshiped here, and worships now. Kara’s life impacted more than she will ever know. For good. For God. Her suffering has ended. For all who loved her, it will begin in a whole new way. Our hearts are broken … but she is whole. She is whole, and she is His. Kara finished the race exactly three years and six months (to the very day) that my mom crossed the finish line. Both were ushered home through Hospice care; both won their battles against breast cancer. And on both occasions, when I heard the news, my first reaction was one of relief. Not relief that they were gone, no. But a blanket of relief at the awareness that nothing more could happen to them. Nothing more could go wrong. Relief. It’s not an emotion typically associated with grief. And it hurts, for us. It burns deep within, an ache that matches no other. 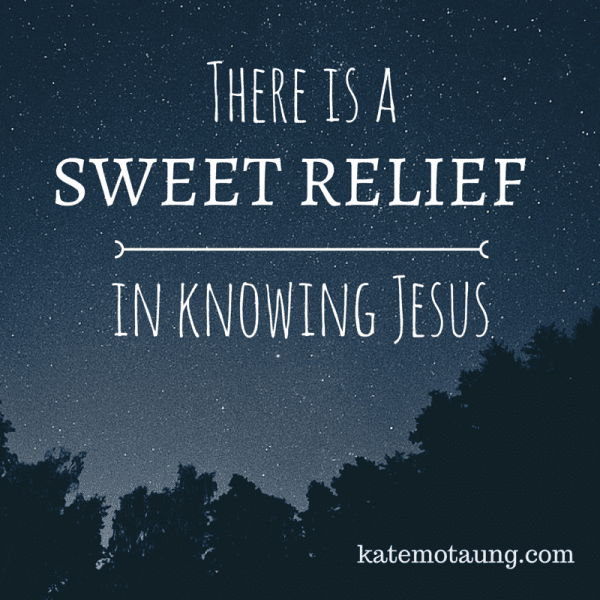 Yet there is a sweet relief in knowing our Savior — the only One who can grant that peace that passes understanding. Our God is the Father of compassion and the God of all comfort (2 Cor. 1:3). And “just as we share abundantly in the sufferings of Christ, so also our comfort abounds through Christ” (2 Cor. 1:5). Let’s not forget that part. Yes, it hurts. The grief is far too real. But comfort abounds for those who are held by Him. Linking up with Jennifer Dukes Lee for #TellHisStory, and with Meredith Bernard for #Woman2Woman. Read Jennifer’s beautiful post about Kara here. Read Meredith’s moving piece on the purpose of suffering here. She set a fine example of courage, and she’ll be missed. Yes, there is a comfort that only knowing Him can bring in the face of tragedy and death. I cannot imagine getting through this life here without it. Kate, how lovely to connect with you today through Jen’s linkup! Thank you for speaking comfort over all of us who grew to love Kara. I want to jump right through this computer and give you a big hug and hear all about your mom. We are walking through grief here in Florida as well — my best friend lost her husband to lung cancer last year. I am thankful that our Abba is well acquainted with grief and that He counts all our tears in a bottle. Much love to you, sweet sister. Beautiful tribute to Kara! How are we going to live like her? What are we going to do in those mundane days of faithfulness? Praying for Jason and their children. Yes…Kara was a beautiful woman in her life as far as I could know it through a book and a blog, and oh, such a woman in her dying. I am a better person because of Kara, I do believe. I lift up her precious family and know that our God of all comfort is holding them right now. Our legacy in life is not at all in the things we do, but instead it is the marks we make in the lives of those around us. I have not ever met Kara, and haven’t yet read her words but her love and faith are evident in the lives she touched. She has left a beautiful legacy of love and it is living vibrantly, still touching and inspiring others to pursue Him. Grateful for this glimpse. I’ve been in the middle of a story…it is one that involves a loved one and cancer. Kate, your writing has truly ushered me into a place of peace with God over this matter. You’ve written on it several times and I’m not sure I’ve commented even once. Thank you for your words and the way that you weave them into the hearts of those who are struggling with this in our own lives – rather directly or indirectly. I am grateful for them…more than you know. This means so much to me, Jennifer. Grateful to God for using these feeble offerings. Bless you, and may the God of all comfort give you strength, sufficient grace, peace that passes understanding, and new mercies each morning. So heartbreakingly beautiful! And this: “But comfort abounds for those who are held by Him.” Just that! Thank God for that! When my grandfather and my father-in-law died, I felt not just that relief – but that joy that they were in heaven – they are waiting – but life here sure misses them. Praying for her family as they learn to live without her in the daily! Poignantly beautiful tribute of faith in loss for this beautiful woman! Kate, I have been amazed at how someone I never met has so impacted my life. I am so grateful for our God who truly brings us comfort & for the hope we have in Him. Beautiful tribute. I want to say, thank you, for your own transparency as you share on loss & grieving. Your words always bring comfort. Blessings today to you!